The FLA had Anne Marie Waters leader of For Britain speaking amongst others. As both were running in opposition to each other, it was difficult to see which I could attend. Prior to the two seperate protests, Police had warned of increased officers in Birmingham. Therefore, my concern was not to get caught in any trouble that could possibly happen between two factions and the Stand up to Racism march also taking place – or get arrested. Also, George Galloway reporting Russia Today, had released a documentary on Britain and the far right, with special mention of the FLA.
Of the 965 England fans arrested in Holland and Belgium, only 30 were known football hooligans. Some 409 of them however did have other convictions, including for violence. Galloway, over generalises in his piece on football hooliganism. Galloway, indicates the EDL were homophobic in the organisation. Busher (2015) has indicated that the EDL were in fact inclusive of most groups (LGBT and Jewish flags were seen at EDL rallies as well as have Facebook groups on the EDL pages). Also, Galloway is rather forgetful that many members of the FLA/DFLA are Brexiteers, like himself (this is if one takes some of their post on their twitter accounts. Hardly the best way, but a rough estimation). Therefore, it might have been worth framing the argument better than it was and not as a sensationalist peace of journalism. Anyway, after getting up at 5am to get a bus from Victoria Bus station for departure at 7am. I got to Birmingham at 9.40 and decided to go to the DFLA protest, as I kept being sent and going to the wrong one place for the Curzon Street place. 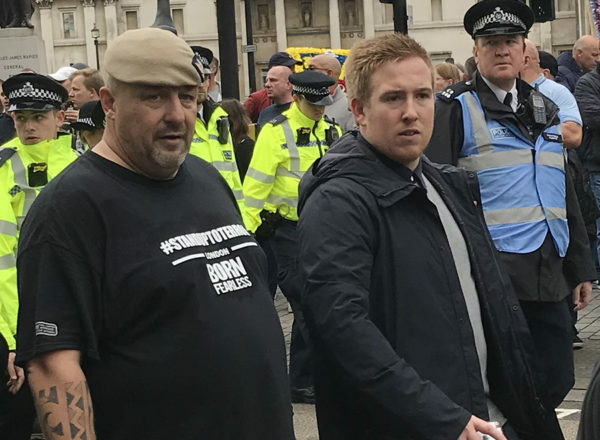 I also felt the DFLA would have a smaller crowd, due to its newness. Even before the talks I made some initial observations. Firstly, the heavy degree of police present, due to the assumed idea of trouble between the FLA and DFLA. In fact it was polite and easy going, plenty of stewards. With the fear of trouble with the events starting at 12pm and both organisations expecting large crowds, the local authority closed all public houses in the town centre until 4pm for public safety. Again, the argument was framed that alcohol would cause problems. Not an uncommon theme (Pearson, 2014, Dunning, 2002, Perryman, 2001) within football fans. This seemed rather over the top and costly to businesses within the Birmingham City Centre. I also noticed the importance of the football lapel both the DFLA and FLA sell, often used as signifiers of group identity. I noted that both groups were looking at what lapel badge members were wearing. Adam Brown has discussed this previously (1998) in that fans see it as seeing you are ‘ok’ and with the group if you have a lapel badge. I also looked in on the Stand up to Racism march, which had maybe 200-300 (max) people there. Hardly a major gathering. Anyway, I went up to the Town Hall and I’m just going to bullet point my initial observations recorded from the day. If anyone wishes to see the whole of the DFLA event you can find it here. These are views based purely on my observation. Attendance was sparse at first, when I attended around 12.20pm (see image below), but by 12.35 two fairly large groups came in singing ‘Justice for the 21’ to the sound of Pet Shop Boys ‘Go West’. Justice for the 21 is the campaign seeking Justice for the 21 victims of the Birmingham Pub Bombings, created by Julie and Brian Hambleton with other families from those killed by the IRA bomb in Birmingham in 1974. By 12.35 I’d estimate about 2,000, predominantly white males around an average age of 35-40 and a large amount of flags, including unions jacks and DFLA flags with team identities on them. In singing both songs, they were siding with ‘Justice for the 21’ and that Lee Rigby is a spot remembered (the remembrance would also be a place to underline the murder by Muslim extremist). The Lee Rigby remembrance is important in that, allegedly his family have asked for no remembrance where he was murdered. They are also common football chants and underlined they were ‘fans’. One of the comments that resonated personally was the compere, as this is a reason I was interested in the FLA and DFLA. This statement was ‘Blues [Birmingham City], Villa and [West Bromwich] Albion come together. How bad can things become?’ The idea of a politicized fan base has been discussed recently by a new football collective member Dougie Brimson who discussed the impact of the FLA/DFLA (2018) and looking beyond internal rivalries of teams is interesting to be a political force within Britain. The other speeches, I thought were pretty poor. Hembleton’s was focused and had a core message (that of justice being served). The UKIP guys Gerard Batten and Bill Etheridge just seemed to be rather lacking in any substance, with Etheridge pointing out he was a Wolves fan and even he could see the DFLA policies for the Justice for 21, the Muslim grooming had to stop as did Islam extremism. No mention of Police just that they’ll ‘defend our way of life’. The small number of attendance. I’d expected at least 5,000 and I asked a Police officer what was the expected number. He said 20,000 (I assume that was with both the DFLA/FLA). I’d say it was nearer 2,000 at the DFLA event. The DFLA also discussed more marches at Telford, Rochdale, Rotherham and Manchester against grooming by Muslims and the terrorist attacks. I’d think these marches will garner less support, as Busher (2014) has indicated, after the initial furore of joining, people start diminishing in numbers. Ironically, the funniest thing was how very ‘British’ it was and highly socialised. The organisers asked for good behaviour which was followed. People who had meet online via Facebook spoke to each other in person. Plus, one gentleman, very nicely assisted as Muslim lady up the steps with her pram. The Speeches by Anne-Marie Waters from Britain First and Decibel 120 amongst others can be found here. Rather perplexed to be honest. Low crowd attendance on all three groups was my first thought. The lack of professionalism as well. That is meant as a criticism, not a personal insult. A map of the events would have helped. Times for speakers to. It all seems rather ad hoc on occasions. The split of the FLA/DFLA was rather ignored rather than discussed. This might fracture or bring them together again, it hard to say. I could add more, but i’m sure 1700 words is enough. *Profanity and racist language is found within these videos. I in no way condone this language, so listen at your own discretion. Les Crang has finished his Msc in Sport Management & the Business of Football at Birkbeck. He will be discussing his initial findings on the FLA/DFLA at International Football History Conference 7-8 June 2018 in Manchester. Brimson, D. (2018). If football fans want to become a political force, the next step is obvious.. [online] A Write Old Life. Available at: http://writers.dougiebrimson.com/2018/03/20/football_march/ [Accessed 25 Mar. 2018]. Brown, A. (1998). Fanatics: Power, Identity and Fandom in Football. 1st ed. London: Routledge. Busher, J. (2016). The making of anti-Muslim protest. 1st ed. London: Routledge. Dunning, E. (2002). Fighting Fans: Football Hooliganism as a World Phenomenon. 1st ed. Dublin: University of Dublin. King, A. (1997). The Postmodernity of Football Hooliganism. The British Journal of Sociology, 48(4), p.576. Pearson, G. (2014). An ethnography of English football fans. 1st ed. Manchester: Manchester University Press. Perryman, M. (2001). Hooligan Wars. 1st ed. London: Mainstream media.